It’s Wednesday, so that means my person meets up with her friend, Fabulous, the fashion designer. They walk and run and talk, talk, talk. It’s awesome because I usually manage to pick up lots of information from their conversation. Except that this week, she was in such a rush to get out the door this morning she totally left. me. home. Yup, sitting at home- by the door, with my socks. She had worn flip flops so I figured that she’d remember at some point and come fetch me. Either sooner- like right after she left, or later- like after work but before heading to meet Fabulous. 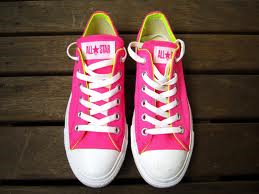 When she realized her mistake, she rummaged through the back of her car and came up with two alternative options to running in flip flops… black high heeled pumps, ooooooooor, hot pink converse basketball shoes. & no socks. Looking at the bright side- at least she ran, right? The lack of support and cushioning probably insured that I won’t get left behind again either.